Good Rockin' Tonight – from Graceland Crossing, Elvis Week 2008 (Memphis, TN). Love Me – from “Images of the King” contest on 11/4/07 – Wrenn won 1st place at this recent regional contest. Wrenn's current project is a solo salute to the original rockabilly pioneers and artists of the 1950's, channeling early Presley and the traditional spirit of rock and roll with an uncanny authenticity. With only a microphone, guitar, and amp, Mangum takes you back to the way it was when life still seemed innocent and the cars were cool. After earning a degree in Painting and Printmaking from VCU in the early 1990's, Mangum fronted the popular Richmond bands Frog Legs and Donkey Balls, which incorporated performance art and comedy in an original rock setting. 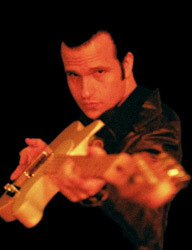 He was also the frontman of the rockabilly group The Wild One, which combined early rock and roll with songs by artists as stylistically diverse as The Misfits and Lucinda Williams. Currently, when he's not doing solo shows, you can catch him performing with the original rock band Boneanchor. Members Morgan Huff and Tom Illmensee have been writing, recording and rocking with Wrenn for over 15 years.